You have likely come to expect some artificial flavors and colors to make an appearance in the standard junk food items that sit in your pantry. For example, the macaroni and cheese from a box sure isn’t so orange when you make it from scratch. And the flavors found in that fluorescent pink punch are anything but fruity. But what about the food you consider healthy…the food you don’t really think twice about when you take a stroll down to the local market? There are suspect foods that you should know about, masquerading as healthy superstars. Foods like salmon. Salmon has superfood status. It is rich in omega 3 fatty acids and a great source of vitamin D, not to mention minerals like iron, calcium and selenium. As with many of the superfoods that are held in high regard in the food industry, there is a whole other side to salmon that you might find a little fishy to say the least. 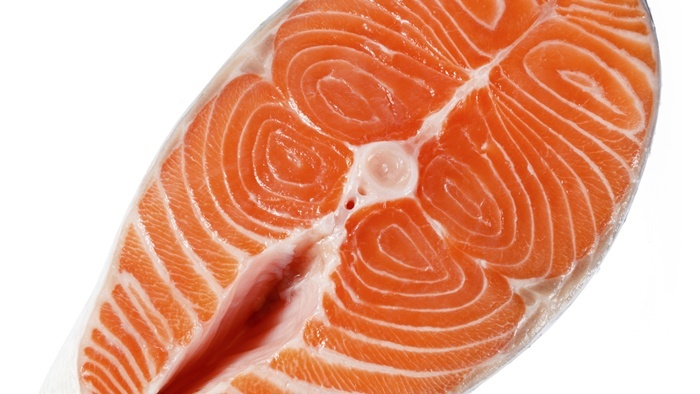 The trouble lies in farmed salmon. Farmed salmon is grown in nets under the water until it is large enough to transfer to a pen. But farmed salmon doesn’t look so tasty without a bit of help. Farmed salmon is a dull gray color because these fish are fed fishmeal pellets. Wild salmon is pink because it eats shrimp or krill. It is possible for farmed salmon to be appealingly pink, too. But if cutting costs is the name of the game, it stands to reason producers may not be feeding their salmon high-quality crustaceans! Salmon farms often use the cheap fishmeal and then apply a food-coloring agent called canthaxanthin. This coloring aid gives the salmon that healthy flesh tone for much less than it costs to feed their salmon quality feed. Not exactly something you want appearing on the menu! The United States Food and Drug Administration (FDA) requires all farmed salmon with coloring to be clearly labeled on food packaging, but when you purchase your fish fresh at the counter, it comes without producer packaging; it’s wrapped in paper and plastic and handed over to you. An omission on the label is a big deal to the consumer. In fact, in 2003 the sale of salmon was prohibited in the U.S. unless there was proper label indicating the use of this coloring agent. If you were to look on store shelves, it’s very common to see salmon in plastic and Styrofoam packaging with no writing at all, and many of the big box stores continue to sell their salmon without a label, too. Not only this, but the price tag is going to be a dead giveaway. Salmon that is farmed can go for about half the cost of wild Alaskan salmon, for example; it could be the price difference of $7.99 per pound and $14.99 per pound. Keep in mind, too, that fish can be seasonal, just like produce. If you can’t find what you are looking for easily, or have any apprehensions, it might be better to keep the good salmon (such as wild Pacific Sockeye salmon) in bulk in your freezer. This way, you won’t run across any imposters in the off-season and feel the urge to choose the cheaper or artificially-colored salmon by default. “Opinion of the Scientific Committee on Animal Nutrition on the use of Canthaxanthin in feedinstuffs for salmon and trout, laying hens and other poultry,” European Commission, Health and Consumer Protection Directorate, Brussels, 2002, retrieved from http://europa.eu.int/comm/food/fs.